Welcome to Gowanus Grove, a little slice of paradise in the middle of industrial Brooklyn. 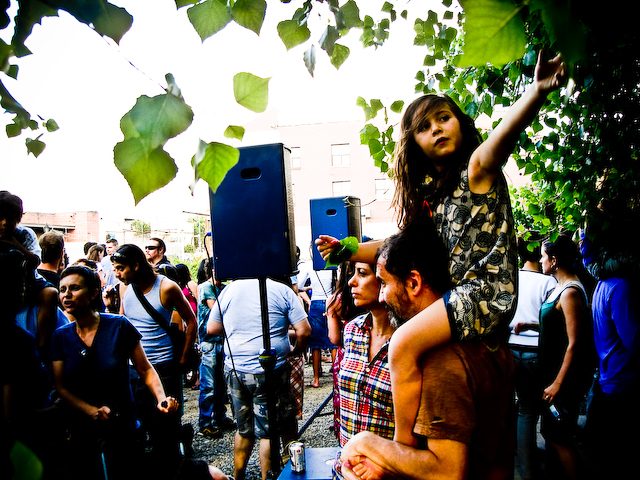 Situated on the border of Carroll Gardens and Gowanus, the site has been a long-time home for cultural events (once as the home of Issue Project Room and then of BKLYN Yard), its bucolic setting the perfect respite from the concrete and steel that surrounds it. Gowanus Grove is located at 400 Carroll Street between Bond and Nevins in Brooklyn. To get there, you can take the F or G train to Carroll Street. Mister Sunday resides at Gowanus Grove every Sunday during the summer. Check the schedule to the right to find out when we’ll be there. note. Occassionally we’ll host a non-Mister Sunday special event at the Grove. If you’re looking for information about such an event, refer to its website for more info. We just list the Mister Sunday stuff here! Thanks, and we we hope to see you soon! Thanks god!!! You were missed and will be welcomed back with open arms!!! Yes!! Hopefully I can make it out this time – Ogden in tow! I can only imagine that Ogden is dancing already. Knowing you, he learned to do the running man before he learned to walk. I am so happy to hear you guys are back there!!!!! Definitely put a smile on my face 🙂 !!! Wonderful! This will make my kids’ summer!